ABIDJAN, Ivory Coast – January 25, 2011 (WPVI) — Ivory Coast’s internationally recognized leader ordered a one-month ban on cocoa exports starting Monday in a test of his authority as he battles the incumbent clinging to power for control of the world’s largest cocoa-producing country. While the United Nations, U.S., France and the African Union all have endorsed Ouattara’s presidency, he is attempting to run the country from a hotel under the protection of hundreds of U.N. peacekeepers. Gbagbo, who has been in power for a decade, still controls the country’s military and security forces. Port authorities in Ivory Coast are believed to be staunchly pro-Gbagbo, but both men draw support from the country’s cocoa farmers. Government statistics show Ivory Coast exported $2.53 billion worth of cocoa in 2009. Ivory Coast’s production has been declining, from 38 percent of global production in 2007-2008 to 33 percent in 2009-2010, according to the International Cocoa Organization. While Ouattara’s announcement sent cocoa prices higher on Monday, the long-term impact on companies producing chocolate is unclear. Companies usually have a few months’ supply on hand already, and cocoa that was registered and paid for before Sunday is explicitly exempted from the order. Cocoa futures on the Liffe commodities’ exchange in London were up 3.9 percent Monday to 2,223 pounds per ton, the highest since early August, after trading as high as 2,290. Cocoa traded as low as 1,770 pounds in November. In a joint statement, the Brussels-based European Cocoa Association and the Federal of Cocoa Commerce Ltd. in London said they hoped for a quick resolution of the political tensions. “Time, patience and a common sense approach to the difficulties and delays that may arise are required, but most importantly, all those whose interests are impacted should remain calm in order that we sustain no long term damage to Ivorian farming communities and the cocoa industry,” the two industry groups said. Harvey Cabaniss, who sells Pierre Marcolini chocolates at Verde & Co. in London, said he was resigned to higher costs. The call for an export ban in Ivory Coast is aimed at further stepping up the financial pressure on Gbagbo, who lost a key ally on Saturday. The president of the regional central bank resigned amid accusations that he was funneling funds to Gbagbo despite a bank order to cut him off from state coffers. Gbagbo, though, appears to still have enough money to pay the civil service as salaries began to be paid on Monday in the commercial capital of Abidjan. Other civil servants are due to be paid later this week. This is the second month that at least some of the salaries have been paid, but it is unclear how long Gbagbo will be able to stay solvent with dwindling access to finances. Ouattara’s allies hope for mass defections if Gbagbo cannot pay civil servants and soldiers in the military. Gbagbo’s government already has tried to order U.N. peacekeepers out of the country, claiming that they are no longer impartial after the U.N. certified election results showing Ouattara won the Nov. 28 presidential runoff vote. The U.N. Security Council voted last week though to send an additional 2,000 troops. The 15-nation West African bloc of countries known as ECOWAS has threatened to oust Gbagbo by force if negotiations fail, but has set no deadline for such an intervention. Nigerian newspaper ThisDay published a guest editorial Monday written by Nigeria’s Foreign Minister Odein Ajumogobia, calling on the U.N. Security Council to pass a resolution sanctioning the use of force to remove Gbagbo. On Monday, lawyers filed two separate lawsuits in attempts to stop ECOWAS from sending troops into Ivory Coast. The court has agreed to hear both cases in early February in Abuja, where ECOWAS is based. Associated Press writers Robert Barr and Martin Benedyk in London; Bashir Adigun in Abuja, Nigeria; and Jon Gambrell in Lagos, Nigeria contributed to this report. 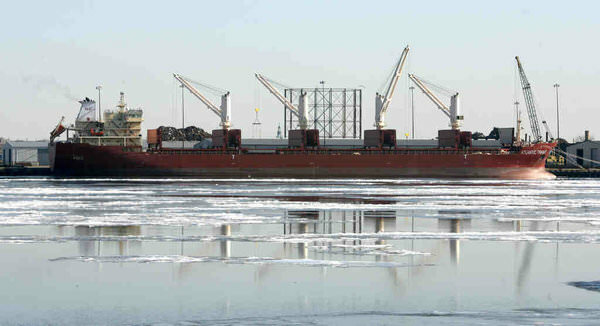 A 10 hour day for longeshoremen, dock and warehouse workers in Camden on Tuesday involved unloading 283,000 bags of cocoa off of the largest ship ever to sail from the Ivory Coast to the U.S. The Atlantic Tramp docked here on Saturday night, and it’ll take six days to unload the bags worth $60-million. It’s a lot of work, but it’s welcomed work for these crews. Especially, since cocoa and chocolate making is the main industry for our ports. From the ship, the cocoa beans then get sent to a warehouse where they’ll be shipped off to the big five chocolate making companies in our region. One of them, Barry Callebaut with plants in Pennsauken and Eddystone, tells Action News, they’ve already bought what they need and their factories and stock levels are sufficient. James Farthing, Vice President of the Delaware Stevedores, says problems in West Africa affecting imports is nothing new and generally works themselves out. “There’s a lot of economics involved, so usually when there’s a that much economics involved, people find a way to make things work,” Farthing said.